All training is done by a Certified Dog Trainer specializing in Greyhounds. Please see the Bio page for more information. For busy people who don’t have time to attend regular classes or whose physical limitations may make dog training difficult, board and train is a great option. Your Greyhound will be trained one on one by GreyMatters trainer, Kathy Marggraff. A typical day will include both training and playtime throughout the day while still allowing time for those all too familiar Greyhound nap sessions. Your dog will enjoy their stay while learning new manners that you can be proud of. You will receive photo and video updates of your dog's progress while in training and you are even welcome to come visit him or her if you like! During training weekly nail trims are included at no charge as well as a bath the day before your dog goes home. All packages include a completed progress report and a follow up lesson after training is finished. In this lesson your family will be shown the commands your Greyhound has learned and what you need to know to maintain his or her improved manners. Contact us to inquire about openings and prices, space is limited. 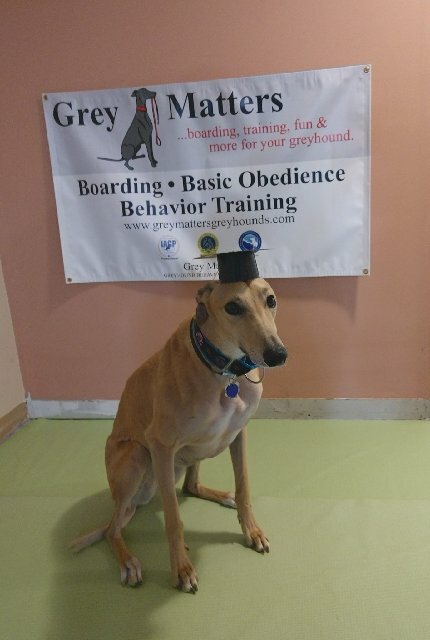 ​For dogs that are both a GreyMatters Student and boarding client refresher training is always done during his or her boarding stay at no additional charge. Often Greyhounds need one on one training with specific issues such as learning how to walk on stairs or jumping in the car. We can help with these issues and more teaching your Greyhound to successfully navigate these tasks with ease and make you proud of him or her! ​Problems like resource guarding and nipping or biting can quickly escalate into a serious issue if they are not addressed. This is often a cause for families to return their Greyhound to the adoption group. This is best worked on in the environment where the problem behavior is occurring, usually the home but, may also be in a public place such as a park or store depending on the issue. You can pay for a single behavior consult and some problems may be resolved with only one consultation but typically most owners and their dogs require a longer commitment and more follow up to resolve an issue. Please contact us if you would like to set up a behavior consultation or to inquire about any other service not listed. Home visits are limited within the Atlanta area. We also offer a group obedience class for Greyhounds only. In this hands on class you and your Greyhound will be taught the following commands: sit, down, stay, here and wait. Classes are held at the Grey Matters kennel in Powder Springs, the 6 week course is $95 per dog. Space is limited. ​The next class begins March 31st. If you would like to attend up please sign up under classes to reserve your spot.